This deadly shooting could have been prevented. Sadly, the Marysville shooting showed us all that if someone was watching Jalyen’s Twitter account this horrific act may not have happened. Teens today are given access to the adult world unlike any other time in history. At a time when developmentally they need as much supervision toddlers, most parents turn a blind eye to their teens social media behavior. The teen brain isn’t done developing just because your 16-year-old daughter looks 21. In fact the high school years are when they need parents in their business, not just in person, but online too. The tragic shooting this week by freshman Jalyen Fryberg in Marysville, Washington, prompted me to speak out about the teen brain and how the lack of supervision online can have deadly outcomes. If this case teaches parents something it is to become aware of what their teens online persona is telling the world, which for this young man, and many teens I work with, expresses more than they would ever say out loud. Their impulsive tendencies don’t just come form hormones, its their changing brain that leaves them emotional and unable to make good decisions. The shooting is a sad reminder that parents need to be up to speed on their child’s social media and inquire more about what’s really going on behind the screen and in their day to day lives. “[You’re] gonna piss me off…and then some [stuff’s] gonna go down and I don’t think you’ll like it…” “[F] it! Might as well die now.” Jaylen tweeted. If Jaylen Fryberg’s parents were monitoring his social media do you think the Marysville shooting would’ve occurred this week? Tweets that threatened others and suicidal posts showed he was struggling emotionally. I have no doubt that his parents were unaware of his posts, what parent wouldn’t step in if they saw suicidal and aggressive threats? I am praying for them and their whole community. At the same time, this is a wake up call to parents. Two of the victims of Jaylen Fryberg’s rampage at Marysville-Pilchuck High School were his own cousins. Jaylen, 15, was reportedly angry with his cousin over a girl. Jaylen also allegedly shot the girl they were fighting over, according to the victim’s friend. Just weeks before he was suspended for fighting, and his social media shows he was obviously angry. Does he sound like a kid who could control himself or self-regulate? If his parents knew about this I would imagine they would have intervened. Do you think this shooting could have been prevented if parents were supervising social media, I sure do. Your teenager’s social media speaks volumes about their feelings, and the scariest part is they are broadcasting them for the whole world to see, well everyone except their parents. Just because your teen looks mature, doesn’t mean they can handle and manage all the privileges adults in their lives are giving them, starting with technology. Due to a variety of factors people do stupid things on social media, both adults and kids. The problem with teens having access to the world all the time is their brains often make impulsive decisions on their behalf. Just like when you road without a seat belt high school or lied to your parents about a party, teens today are typing away without a second though of how it will impact their future. In Jaylen’s case, they are taking it offline too. Look at the research from above, does a it look like they can resist the urge to tweet about their feelings, pause before they post something incriminating on Facebook? If your teens behavior and attitude at home makes you wish they could bite their tongue then it is likely they are over-expressive and under-effective online, leading to a messy digital footprint. They are making adult decisions at an age where developmentally their brains are not equipped to do so. Just because they look like “little adults” doesn’t mean we should treat them as such. Research has always supported that the adolescent brain is still developing in the teen years. In fact maturation continues into ones 20’s. The reason for impulsive behavior and poor decision making isn’t just due hormones, it is actually due to the change in brain regions. Due to fast-growing synapses, pruning and sections of the brain that remain unconnected, it leaves teens more prone to impulsive behavior and defiance; not because they want to make bad decisions, but often because they truly cant think before they act. Do you feel like grabbing your teens phone yet? Good, you should. FRONTLINE’s “Inside the Teenage Brain” focuses on work done by Dr. Jay Giedd at the National Institute of Mental Health in Bethesda, Md., together with colleagues at McGill University in Montreal. Giedd. This fascinating series is worth watching. The prefrontal cortex sits just behind the forehead and begins growing again just before puberty (last time it was when they were infants). It is particularly interesting to scientists because it acts as the CEO of the brain, controlling planning, working memory, organization, and modulating mood. 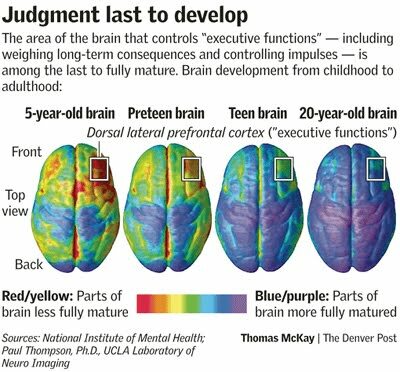 As the prefrontal cortex matures, teenagers can reason better, develop more control over impulses and make judgments better. 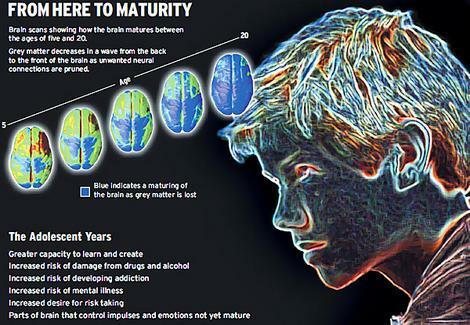 In fact, this part of the brain has been dubbed “the area of sober second thought.” So it’s now wonder teens have trouble with managing emotions and controlling behavior, their brains wont let them! Temporal lobes- still developing after age 16; is responsible for emotional maturity, reading others behavior and rational thought. What does all this mean? The brain changes during adolescence, risk perception decreases, teens seek higher levels of stimulation to achieve pleasure, emotions seem to last forever, impulsivity is difficult to control, and a more egocentric individual emerges. Although we know very little about Jaylen Fryberg, , nor have his parent’s statements been released, we do know that he wasn’t as happy as those interviewed state. We know that his brain was developing and that his emotions were running the show. We know he had a motive and sadly that lead to the death of an innocent 14 year old, himself and left four others in critical condition. If parents understand that their teens brains are still developing, and alter their parenting style to help their children (and family) work with this new brain, we will see happier and healthier teens. The more you create a healthy paranoia around technology, the more you are protecting your child and community. Often and intermittent phone and social media checks, encouraging your teen to report abuse online and harassment, helping them set up safe social media profiles, and setting up time away from technology the more they will be safe from making poor decisions online and in person. Sending light and love to the victims, their families and the Marysville community.